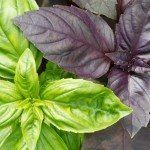 I noticed this morning I have purple spots on my sweet basil leaves. I have sprayed fungus spray on them in the past. They were wilted yesterday and I watered them last night. The purple coloring usually indicates a mineral deficiency. I like to feed my herbs with a little Epsom Salt weekly. I would caution you: carefully wash the Basil leaves now that you have treated them with a chemical before consuming.